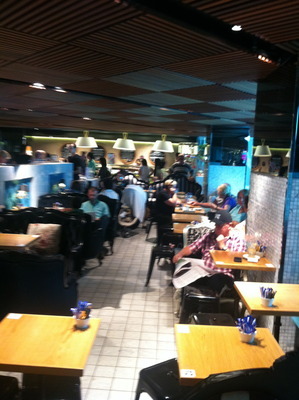 Coco Noir is one of Sydney City's newest cafes, thanks to the new Westfield Sydney that opened up just over a year ago. Tried this establishment as soon as it opened, and my latte was just bitter and tasted a bit burnt. It could have been something with the roasting, and perhaps the coffee machine was in need of a thorough cleaning. Who knows. However, on a positive note: just recently went back to this establishment as I could not resist a coffee after all that sales shopping and the coffee was just divine. It is great that this establishment have improved their coffees. My coffee this time round did not taste burnt and bitter, even though I still needed a couple of sugars to enjoy it even more. The ambience isn't really there, and it can be tricky to get a suitable table based on the seating this establishment provides to their customers. It is better to take away. Their cakes are so presentable and well inviting. I am keen on trying the fruit tart, however I think the lack of tables could be a bit of a turn off in trying their food for now. 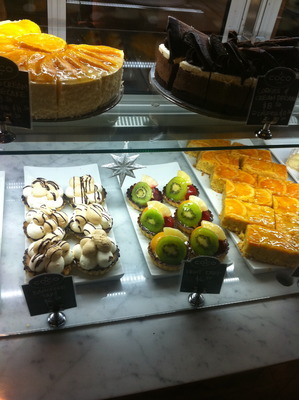 I had a completely opposite experience, excellent service, superb coffee - one of the best in Sydney and great ambience. A definite visit again coffee shop. One other thing, the photo on your site (above) is not the way Coco Noir looks now, maybe this is a photo of another venue.